Found in both deciduous and coniferous forests. Both larvae and adult newts live in small, well vegetated bodies of fresh water, usually with mud bottoms. Adults vary in color ranging from yellowish-brown to greenish-brown dorsally and have black-bordered red spots. The ventral color is yellow and black spots speckle the belly. Once the female lays her eggs, there is no parental involvement. 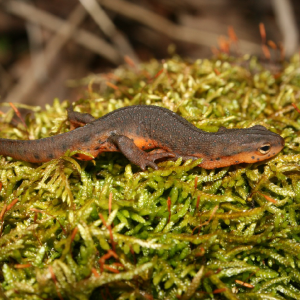 Eft, or young newts, are nocturnal and are more active on rainy nights. Predators include birds, mammals, fish, and other amphibians. Photo By Psyon [CC BY-SA 4.0 (https://creativecommons.org/licenses/by-sa/4.0)], from Wikimedia Commons. Photo has been cropped.